China is a land of diverse wonders. Vast in geographic and ethnic terrains, China is rich in history and legends, cultures and culinary marvels, and the secrets and science in healing and alchemical arts. In this trip we journey to the western wild lands of China. Starting in the country’s “laziest” city, we meet in Chengdu to explore pandas, mouth-watering street snacks, the infamous hot pot cuisine, stunning bamboo forests of Wang Jiang Lou (River Watching Pavilion), Chinese opera and acrobatics and the famous Buddhist Wenshu Temple. Yet our time in the steamy, plant-draped city of Chengdu is short…as the grand Himilayan Mountains jetting sharply up towards the skies…the “roof of the world”…calls us west. A day’s journey outside of Chengdu we head up into the granite mountain terrain to a special region called Siguniang Mountains, or Four Sisters Mountains. It is also known as the Oriental Alps. Here among the 4 majestic peaks of Siguniang, the highest reaching over 20,500 feet (6,250 meters), is where we establish our base camp to explore 3 stunning valleys in the surrounding national parks. We make our home in the small Tibetan town of Rilong, staying at a local family-run inn from where we easily make our daily treks into the mountains, converse with elders and happy children, embark on a native mushroom and herb hunts with Tibetan friends and learn the art of yak tea and butter making! We create this immersion adventure to give you the lifelong gift of rich experiences grounded in the land, wild beauty, culture and kindness of the people. Gifts and experiences like these shape our lives and the gifts we then give on to others. To enhance our experience to the fullest, this trip is a “Qigong and Wilderness” trip, one where we learn, practice the delicious, nourishing and transformative practices of qigong, an ancient Chinese form of breath, meditation and movement that originates from Nature, from these wild and beautiful mountains. Note: Participants are encouraged to arrive in Chengdu at least a couple days early to relax and shake off jet lag. In the morning of Day 1 — Qigong warm-up, breakfast, and orientation circle. Our main objective of these two days: Rest, settle in, learn and practice qigong basics, explore Chinese cuisine, art & architecture, and culture, get ready for the wilderness experience. 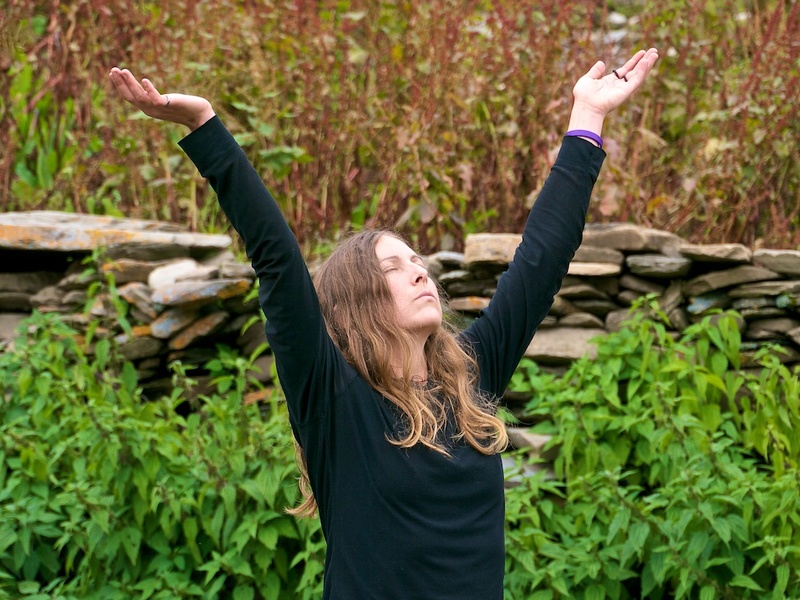 We’ll start each day with a short qigong warm-up. The practice is easy and relaxing, its goal is to help prepare people for the weeklong “qigong & wilderness classroom” from Day 4 to Day 10. We then will explore Chengdu with the following activity options: 1. Wang Jiang Lou; 2. Wenshu Temple; 3. Giant Panda; 4. Sichuan Opera performance. Historically Chengdu was the capital of Han Kingdom during the Three Kingdom era, which may have been the most chaotic but interesting time period of ancient Chinese history. Literature and theater performances love to portrait the stories and vivid characters of the Three Kingdoms, as do the local artisans who sell little clay dolls of popular characters everywhere on the streets. Wang Jiang Lou (i.e. River Watching Pavilion in Chinese) is one of the oldest signature architectures in Chengdu. Now it is a collective name referring to a set of ancient houses, pavilions and gardens, which together demonstrate beautiful and poetic Chinese landscaping. Here is the source of inspiration of the famous female poet Xue Tao of the Tang dynasty. She spent most of her creative career here, hand-making paper notes for her poems, ladling water from a deep well to wash her brush pens, and releasing her magnificent work. She loved bamboos, so Wang Jiang Lou features bamboo forests. There are more than 100 species of bamboos here, including many rare ones. Wenshu Temple is the best-preserved Buddist temple in Chengdu. It has an 11-floor Buddist pagoda, which displays many famous calligraphy, painting, and artwork. Wenshu Temple is also famous for its exquisite garden and solemn halls. Chengdu locals love to come here to socialize and dance. Rows of houses around Wenshu Temple are built mimicking the style of the solemn halls. In the houses you can often find traditional Chinese pastry, souvenirs, local snack food etc. The giant panda is a rare and beloved animal that only inhabits the six major mountain ranges in China. It is one of the endangered spices with a population of less than 2000. Chengdu Research Base of Giant Panda Breeding was established in 1987 to preserve the giant panda and other endangered wildlife. On the western edge of China’s Sichuan Province, the topography begins to rise, changing from the flat green fields of the central plains to the mountains of the Himalayas – “the roof of the world.” As a result of this dramatic upheaval, people see changes in vegetation, animal species, and cultures all within a very short distance. On Day 3 we will drive to the Siguniang Mountain range, located about 200 kilometers northwest of Chengdu. Siguniang, meaning four sisters in Chinese, is known by westerners as the Oriental Alps. Participants will witness the dramatic geographic change during today’s drive. We’ll arrive in the town of Rilong, right at the base of Siguniang mountains, in the late afternoon. Participants are encouraged to walk around town to help acclimatize. 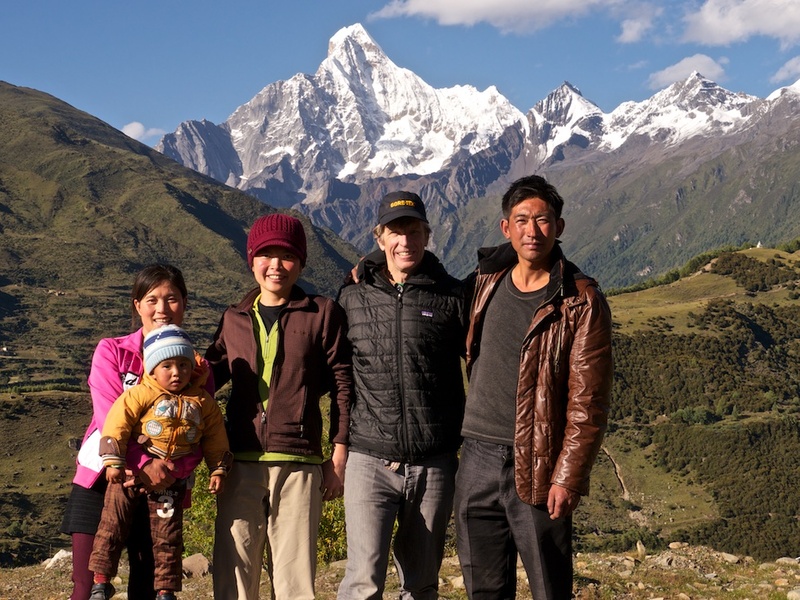 We will set up our base camp in the small Tibetan town of Rilong at the base of Siguniang Mountains and stay in the inn of a local Tibetan family. Here we start our 7-day Qigong and Wilderness Classroom. We will interweave qigong learning and practice (including its origin, philosophy, movement etc — please refer to “A Typical Day” below) with wilderness and cultural activities. 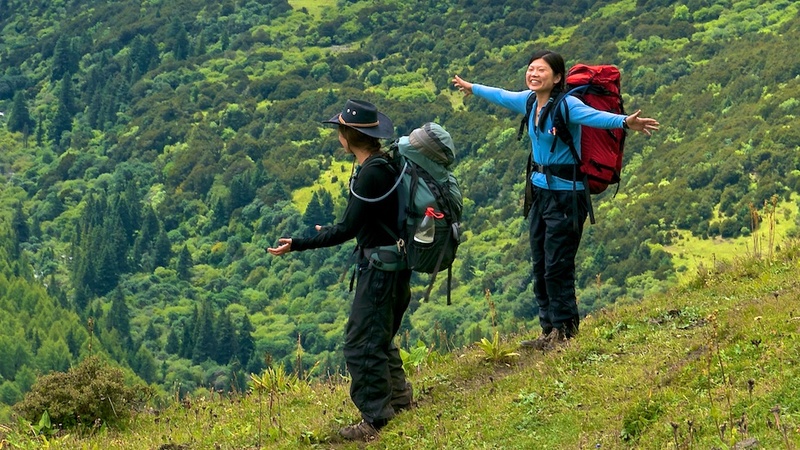 Examples of daily activities include day hikes in the three major valleys in Siguniang mountain range, practicing qigong and training next to pristine alpine lakes, going on herb or wild vegetables picking adventures with Tibetan friends, visiting Yak herders and learning how to hand make Yak cheese and butter etc. 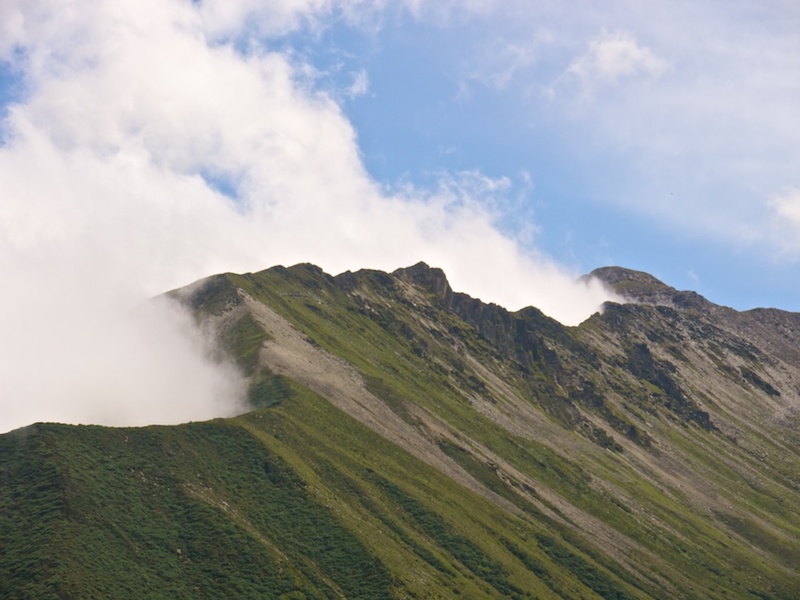 Siguniang mountain region is located about 200 kilometers northwest of Chengdu. The area has attracted climbers and trekkers with its magnificent granite peaks, beautiful alpine meadows, and colorful wild flowers. Siguniang, which means “four sisters” is made up of four pyramid-like granite peaks standing side-by-side with elevations of 5,355 meters, 5,454 meters, 5,664 meters, and 6,250 meters. 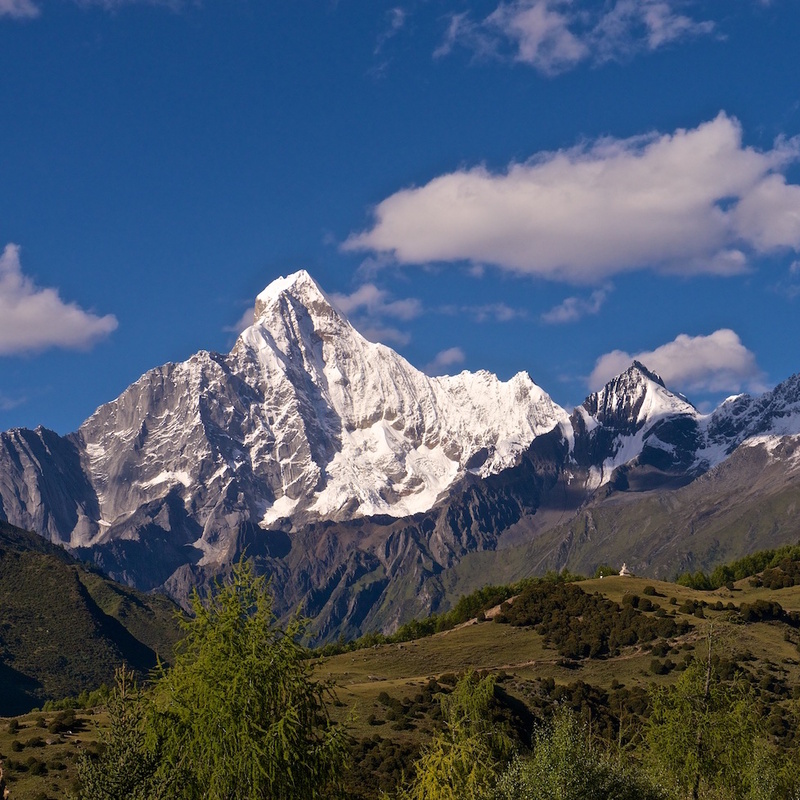 Of course the “little” sister, Yaomei peak, is the highest and the most technical one, and has the reputation of “the queen mountain of Sichuan.” It is also the second highest peak of Sichuan. 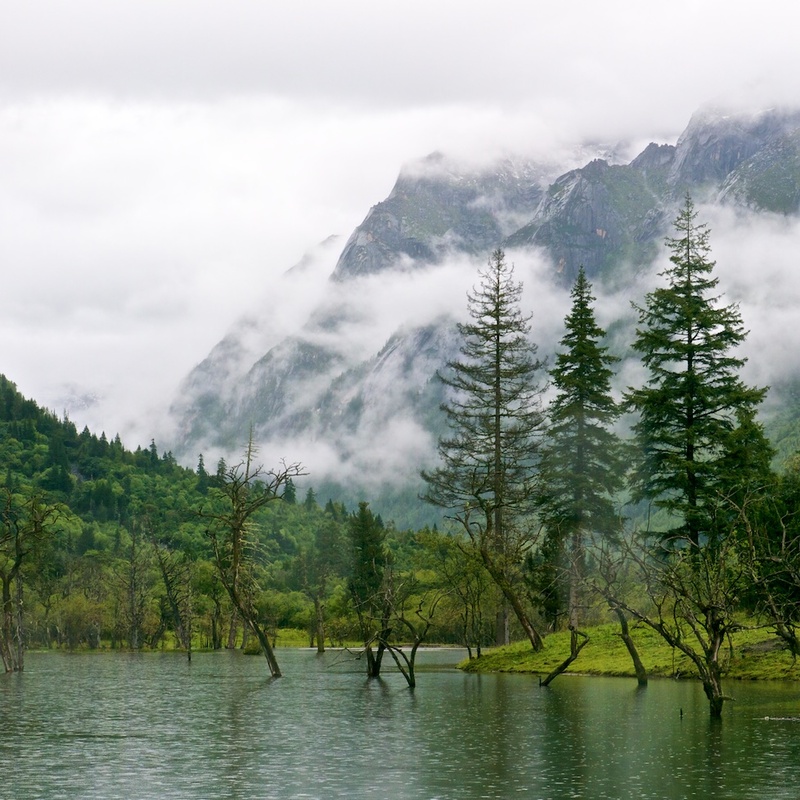 The Siguniang region has three major valleys to explore: Haizi Valley, Changping Valley, and Shuangqiao Valley. Haizi means “oceans” and Haizi Valley has the highest concentration of alpine lakes. Shuangqiao Valley displays diverse plant and animal life as well as countless untouched granite spires. Changping Valley travels right past the stupendous rock walls of Siguniang’s north face. Adventurous backpackers challenge themselves by taking on the thru-hike from Changping Valley to the Bipeng Valley north. This multi-day backpack requires them to cross a high pass and, even though the journey might be strenuous, the seldom-touched wilderness is worth the efforts. When people hear the word “Tibetan,” they would usually think only of Tibet. Yet, there are large populations of Tibetans in Sichuan, Gansu, Qinghai, and Yunnan provinces of China. Visiting these regions offer a unique, unencumbered experience of Tibetan people and culture, as current travel and exploration in Tibet itself is limited and tightly controlled. Also, the word “Tibetan” can be a generic term under which houses at least four subgroups of Tibetans. For example, the Tibetans in Siguniang mountain range are “Jia Rong Tibetans.” Each subgroup of Tibetan has their own spoken and written languages, and sometimes they vary so much that they have to use Mandarin to communicate with other Tibetan subgroups. Jia Rong Tibetans have darker skins and slightly different facial features than Han Chinese. Due to close proximity to Han Chinese regions, Jia Rong Tibetans in Rilong speak both fluent Mandarin and Sichuan dialect. Their daily clothing is no different than the people walking on the streets in Chengdu. However elders still dress in traditional outfits and their Tibetan heritage is strong. Every year the Siguniang Festival and Tibetan New Year are the biggest and most important holidays for them. Siguniang Festival is a sacred occasion. It’s on lunar calendar May 4th, just one day before Han Chinese Dragon Boat Festival. On this day, every resident of Siguniang mountain range dresses in traditional outfits and walks up along Hanzi Valley to a Tibetan pagoda to worship Siguniang Mountain. Chaoshanping is the alpine meadow right next to the pagoda, where Tibetans sing, dance, horse race, and perform other rituals. The festival is also an important day for young people to mingle and socialize. If a young man is interested in pursuing a lady, he will rob an accessory from her outfit and run away. She has to chase him. If she is not interested in him, she will get the accessory back right at the spot; otherwise, she will set up a date and get her accessory back later. Tibetan New Year is an important holiday – people eat, drink, dance, party with other families traveling from one family to the next, day after day. During Tibetan New Year, kids take yak skulls, decorate them, and make yak skull lanterns while each family prepares many yummy traditional dishes. Kids then dance in front of all the families with their decorated skulls and receive this good food and pocket money in return. After New Year, the next big day is the Seeding Day. Every family wants to host the seeding ritual and be the first family to start farming. However, it is too difficult to settle the matter so nowadays families just take turns to host the event. To conclude our epic journey, we will enjoy a restful morning, a final qigong session and review of what we’ve learned, and a closing circle to share and reflect on the beautiful adventure we created together on this trip. We’ll conclude by 12 noon. Price includes the following: meals, lodging (based on 2 people shared a hotel room), ground transportation, horses and horse packers, admission to parks, permits, and bilingual guides, qigong tuition. The price does not include airfare, checked baggage fees, visa fee, travel insurance, personal gear, immunization, personal snacks, drinks, and gratuity. The price is based on a minimum group size of 8 participants. A $500.00 deposit is required to reserve your spot. 50% of your payment is due on Feb 15th, 2016. Full payment is due March 15th, 2016.